John said: "Fabula Urbis lies on the Rua de Augusta Rosa which climbs along the well trodden tourist route from the Sé Cathedral to the Castelo de São Jorge. It is a flagship bearing the cultural offerings of the city of Lisbon past and present. The authors represented have either lived in Lisbon, passed through it or perhaps just simply heard of it! The subjects offered cover a huge area - poetry, essays, novels, painting, sculpture, photography, pottery, tile making, textiles, fabrics and fashion, theater, cinema, opera, music, astronomy, archaeology, gastronomy, history, politics, urbanismo (the streets and trams and gardens and cafes of the city), travelers impressions. Situated above the bookshop is a room impeccably designed with a stage and piano. It is used for evening recitals and exhibitions of paintings or photography, the latter changing generally once a month. Customers can relax there with a coffee or tea. A practicing guitarist or pianist will welcome an audience! Fabula Urbis is not simply a bookshop, exquisite as it is. It is a meeting place of the Arts and a place where strangers meet. Fabula Urbis is quite simply in a class of its own - sui generis!" Fabula Urbis was opened on the 21st of March 2007 with the ambition of becoming much more than an ordinary bookstore. A bit more than two years past this date, it can proudly declare that it has achieved its objective of becoming a new cultural landmark in the city of Lisbon. The founder of this bookstore decided to combine his passion for books and the city of Lisbon and turned the small premises at Rua de Augusto Rosa 27 (you can find out more about the history of this famous Lisbon street bearing the name of the actor, director and writer Augusto Rosa on the bookstore's website), which formerly served as a carpentry workshop, into a space dedicated to the city of Lisbon and all the related subjects. The Lisbon-focused stock holds around 3000 titles, more than 1/5 of them being in foreign languages (including English, French, Spanish, Italian or German). 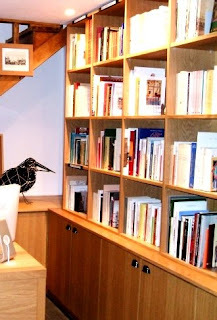 One more interesting piece of information related to Fabula Urbis - the ravens in the logo of this bookstore also demonstrate its affiliation with Lisbon, as a raven is also the symbol of the city. The legend goes that when the corpse of St. Vincent, the patron of the city, was transported by ship to Lisbon back in 1171, two ravens were guarding his body during the whole journey all the way to Lisbon - they symbolize loyalty and are also seen as guards of the city. Fabula Urbis in the heart of the Alfama district is my favorite destination and bookstore in Lisboa. That’s because it is more than a bookstore, It’s also venue for Art, Music and a gathering spot for the local intelligentsia and international expats .Their gallery above the bookstore hosts art exhibits, poetry readings, music and other cultural events. 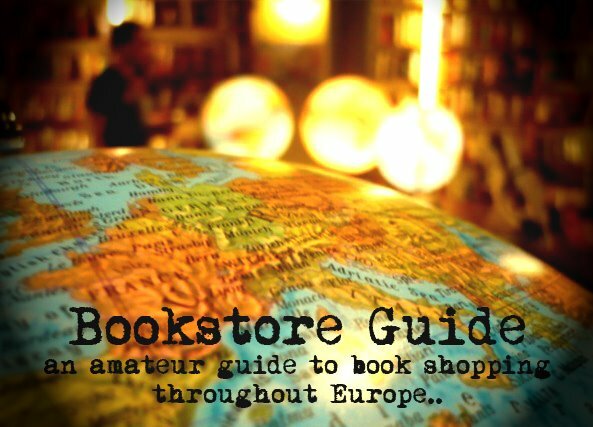 The welcoming owners Joao and Carmo are multi linguistic and are pleased to offer you insight into the history of Lisboa and the culture of Portugal which are featured topics of the bookstore. Fabula Urbis is the destination for getting an intellectual and cultural feel of Lisboa. It is housed in a former chapel turned carpentry. It has a welcoming charm thanks to Joãos and Carmos presence and an open entrance to the mini-square with a bench from which you can see the trams and cars climb the street and see the sun go down over the church tower of Sé. Fabula Urbis offers a good selection of Portuguese literature in different translations (English, German, French, Spanish, Dutch… ). Upstairs there is a gallery with exhibitions, and also tables where the visitor can write a poem or two. Frequently seminars are held in the gallery. It is a must on all my visits to Lisboa and a good place to meet people. 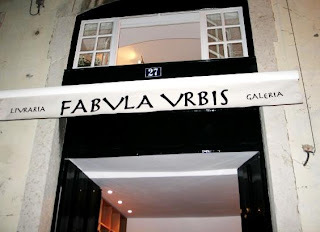 Fabula Urbis was a regular stop during our intellectual sojourn into the cultural life of Lisbon. Centrally located at the crossroads of the Sé (cathedral), historic Alfama, Castelo São Jorge, and Gracia, Fabula Urbis offers an abundant collection of materials that capture the musical heart, the culinary wonders, and the rich intellectual and political histories of Lisbon. In literary and musical texts available at the bookstore, we discovered fado, the music of Cape Verde, the Azores, the Arab and African presence in Lisbon, the writings of Pessoa and Saramago, the richness of Portuguese food, ceramic tiles, and architectural design. In the year we spent in Lisbon, we were never disappointed, always surprised, and warmly received by its proprietors, João and Carmo, who remain our friends to this day. Fabula Urbis is more than a bookstore: it is the intellectual soul of Lisboa.